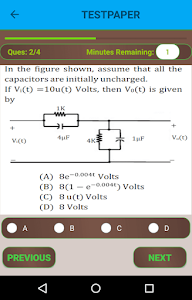 Answer: Data is insufficient as inductor values are not given in the figure. 2. Consider the network graph shown in figure. Which one of the following is NOT a ‘tree’ of this group? 7. In the magnetically coupled circuit shown in the figure, 56% of the total flux emanating from one coil links the other coil. Assume that the switch S is in position 1 for a long time and thrown to position 2 at t=0. 7. In the figure shown, the ideal switch has been open for a long time.